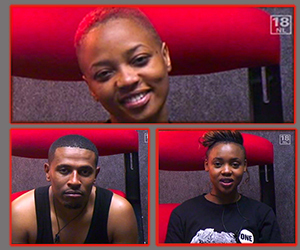 "I feel like it is over for me," Feza confessed to Biggie during her Nomination Diary session this evening. When Big Brother asked her to clear up what she meant by this, she said: "I have lost hope but not in a bad way I think it is a defence mechanism". Feza also told Biggie that she believes that if Oneal had not been Evicted last week, then the two of them would have been Nominated together again this week. "We were easy marks," she declared. According to the Tanzanian, the other Housemates had it in for them because they were so tight and spent most of their time with each other. Her fellow Nominee, Cleo shared during her Nomination Diary session that she believes the best way to make it ahead in the game is, "Being honest with yourself and your Housemates and being true yourself". Swapped Housemate, Bimp told Biggie, "My only hope is that Africa likes me. From the looks of things, Bimp's dream has come true as last week he became the Housemate with the most country votes in the history of The Chase. And his streak of good luck continues on as Dillish was put in his place on the list of Nominees. Bimp is goin nowia he has bn saved bt I pray he does nxt week. I started liking Feza yesterday but have been disliking Dillish.......i want her out!!!! Feza dear sori gal u re Gud to gooooo!